Recently in washing a pot, I splashed some of the residue onto my blouse. Immediately I went to spray stain remover but even after going through the wash cycle, I can still see the faint outline of the spots. David knew confession was the only way to receiving forgiveness for the wrongs he had done. But David desired more - he desired a heart that would not repeat the sin nor fall back into it. David also knew his heart would fail him and only God could give him a heart that would be loyal. David needed a clean heart and so do we. The word "create" is bara in Hebrew and "This means to generate into existence ... implies craftsmanship. It describes bringing something which wasn't into existence or re-creating something into something new" (NLT Study Bible, Hebrew and Greek Word Studies). The word "renew" is khadash and "This means to return an object to a condition or state that is the same as a prior condition" (also from the NLT Study Bible, Hebrew and Greek Word Studies). Let the pronouns stand out - one in particular - "our". It is our sin and He cleanses us. We need to have hearts which confess quickly, feel remorse and repent sincerely. May He not only cleanse us from our wickedness but also keep us from repeating it. May we not "fool ourselves" (see 1 John 1:8) into thinking we have no sin or do not sin or go a day without sinning. Here is the amazing act which God does in our hearts. He takes our soiled hearts and handcrafts them into something new, the condition they were meant to be from the beginning. "Purify me from my sins, and I will be clean; wash me, and I will be whiter than snow." 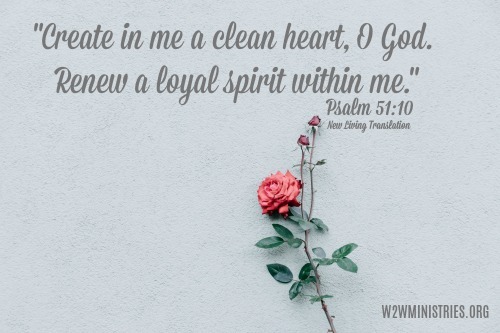 Prayer: Lord, thank You for causing this verse to fall new and personal. Help us to come quickly to You, to keep a short account. May our hearts not deceive or fool us into thinking we have no sin but, You, by Your Holy Spirit bring conviction and remorse quickly. Keep our hearts tender towards Your voice calling us to repentance each and every day, all day long. Amen. I so appreciate this post. God has had me in Psalm 51 for quite some time now, not in a “you’re really a mess” way but in a sweet, healing, going deeper way. It’s been such a time of revelation for me of His tender yet persistent love. He wants me whole even more than I want it. Elizabeth, I so appreciate your sharing. More and more, I am realizing it is a daily and constant healing. His work in our lives is a beautiful and amazing process.